Have you ever wanted to make your yoga, breathe practices, and meditation something that you enjoy and feel empowered to do at home? Join Kari and jean-jacques as they dive deep into pranayama, yoga asana, and meditation. We’ll explore a simple yet malleable sequence that starts with breath, moves into asana, and finishes with meditation that can be repeated at home. In addition to practice throughout the weekend you’ll receive materials to help you continue to grow your home practice. Our time will be structured similar to a typical weekend in the Studio 34 Teacher Training. If you’re considering enrolling in the Teacher Training, then this may be good trial run. 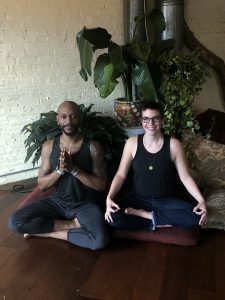 if you’re not, this weekend will serve as a great way to dive deeper into the practice of yoga, pranayama, and meditation, and help you ignite a nourishing home practice. Should you choose to participate in the Teacher Training, any investment over $100 will be deducted from the cost of Teacher Training. Please bring a journal to take notes and reflect.